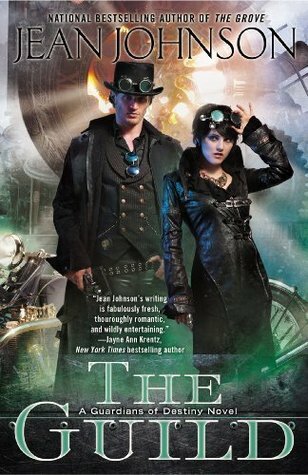 The Guild is book three of her Guardians of Destiny series, after the fun opener, The Tower (reviewed at Reading Reality) and the positively awesome second book, The Grove (reviewed here). As much as I enjoyed The Guild (and I definitely did) there were moments when I wished I had re-read at least The Grove before I got started. It feels like the time periods between The Grove and The Guild overlapped just a bit. Certainly the political infighting at the massive Convocation that is part of The Grove is causing communication difficulties during The Guild. One of the fascinating bits of the worldbuilding in this entire series is that this is a world where gods are real. Every country has its own god, and it is necessary for a country to have a god so that it is represented at the regular Convocation of Gods and Man. Even more interesting, countries get the gods that they create out of their own cultural ethos. With enough belief, a god will manifest, who gets worshipped, which powers the god to do more for its chosen people. However, there is a catch. Mostly good people get reasonably decent gods, and bad people get bad ones, who eventually die because they are not protecting their people so they lose worshippers, one way or another. Mekha, the god of the land Mekhana, is the exception that proves several rules. He’s not just bad, he’s evil and downright crazy. He’s so awful that the Convocation 200 years ago revoked his godhood. He should have died. Instead, he came back worse and crazier, because his priesthood kept believing, or at least believing in their privileged status, and created such a climate of fear that it’s as powerful as worship. Magic is outlawed in Mekhana. Mages are imprisoned and drained of their powers. (Also raped and enslaved). But the priesthood controls everything, and their spies are everywhere. The priests are also the only mages in the country. Everything seems to be working for them, until the new Convocation, the one going on in The Grove, defrocks Mekha again, and this time makes it stick. All the temples and all the priests in Mekhana lose all their power at once. And everything ever built with that power starts unraveling in a hurry. All those enslaved mages? Their slave collars stop working, and they start waking up and remembering years of torment. The priesthood starts losing its grip. Into the power vacuum steps one young woman who has spent her life hiding her gender and her identity as a mage. Rexei knows the worst that the priesthood can dish out, because her mother was taken and drained. But Rexei’s life on the run has given her an in-depth experience of the one force that has kept Mekhana functional all these years–Rexei is not merely a member of Mekhana’s guild system, but at least an apprentice, if not more, in 30 guilds. She’s seen Mekhana’s people at their best, and she knows what her country is capable of, if they can get the right kind of god. Rexei has the way forward, if she’s willing to finally stick her neck out and become the leader she was always meant to be. Standing right beside her is the guild that no one in Mekhana has been willing to admit exists–the Mage Guild will not just come into the open, but the Guild Master finds her combination of innocence and leadership just what he’s been looking for all his life. There’s a better future out there for all of them, as long as they stop a demon invasion first. Rexei and Alonnen, head of the secret Mekhana Mage Guild, are fantastic as the reluctant hero and the even more reluctant heroine. They have both spent their entire lives hiding who they are and what power they have, so the bond between them starts out strong, but not romantic. Rexei doesn’t recognize romance when it slaps her upside the head. Watching them overcome their equal difficulties believing they can have a relationship, side-by-side of their actual conditioning not to be seen as publicly powerful, makes for a fascinating story. I can’t wait for my copy to arrive, I love Jean Johnson’s books so much! And this one with a mix of steampunk in it, lovely. I had several of Ms Johnson’s Sons of Destiny books in my humongous TBR mountain range until very recently. I read the first and had to find and read all the others. Love her world building, and how she deals with the politics of that world, it’s very down to earth.